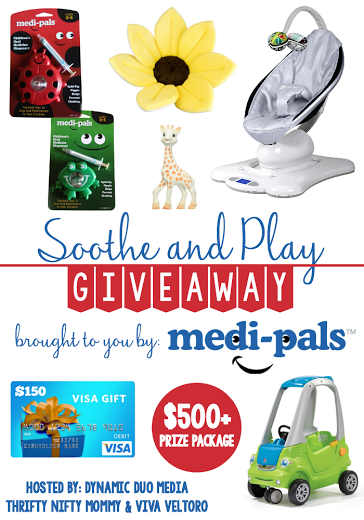 Welcome to the Soothe and Play Giveaway, generously sponsored by Medi-Pals! About today's sponsor: Having a sick infant or child can be emotional for both the child and caregiver, and that's why Medi-Pals created their kid-friendly medication dispensers. Available in 3 fun characters, Medi-Pals dispensers are familiar and fun for the infant, easy for the caregiver to use, and they always ensure that the child is getting the accurate dosage of medicine. Also, Medi-Pals are made in the USA! Thrifty Nifty Mommy recently had the chance to review the Medi-Pals medication dispensers, and she said they worked like a charm! Be sure to check out her full review to get the details on how these dispensers work. Medi-Pals wants to help you SOOTHE your baby so they'll be ready to PLAY - that's why they've put together an AMAZING prize package for one lucky person! 2 Medi-Pals dispensers: Your children will get to take their vitamins and medicine stress-free with Freddie the Frog and Lilly the Ladybug. Open to the continental US only, ages 18 and up. Ends 2/11/15 at 11:59 PM EST. Enter using the Giveaway Tools form below. Good Luck! Disclosure: The Philosopher's Wife did not receive any compensation for hosting this giveaway. One winner will be randomly selected using the Giveaway Tools random selector and notified via email by the hosts of this giveaway, Thrifty Nifty Mommy and Viva Veltoro. Once notified, the winner will have 48 hours to respond or a new winner will be chosen. This giveaway is in no way associated with Facebook, Twitter, Instagram, Pinterest or Google. Void where prohibited. Please note, design of Step2 Easy Turn Coupe may vary depending on in-stock availability as it's being redesigned.